With simple ingredients, this dish comes together in minutes and stores well in the fridge for later on as well. Bruschetta is most popularly known for a toasted piece of bread smeared with roasted garlic then topped with tomatoes and herbs. My recipe is a little quicker than that, understanding that roasting garlic is more time consuming than I can handle right now. If you want to make this more special though, feel free to do this with the bread! The flavor is crazy good. But if you’re in need of a quick dish, simply toast the baguette slices and eat away. 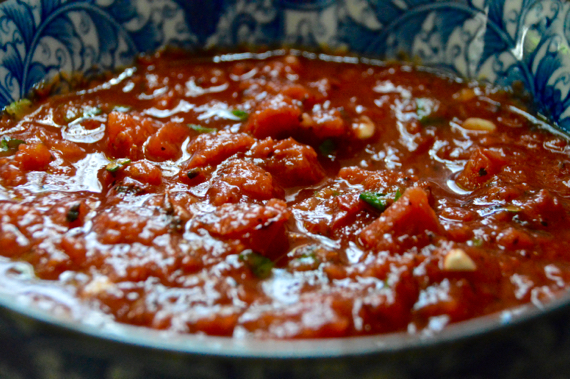 I chose a jar of Muir Glen Organic Crushed Tomato Sauce as my base. I also love the Rao’s brand of tomato sauce as well. It’s just important to check the labels on your sauce. Brands such as Prego or even Classico contain ingredients that aren’t needed in a tomato sauce, and contain as much sugar as a can of cola! 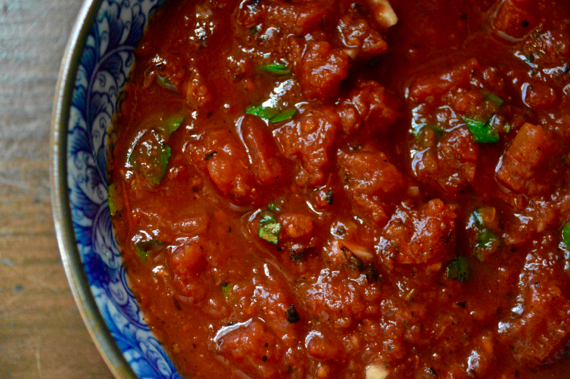 Brands such as Rao’s or Muir Glen contain just what is needed to make a sauce, and nothing else. This way, you get the truest flavor. 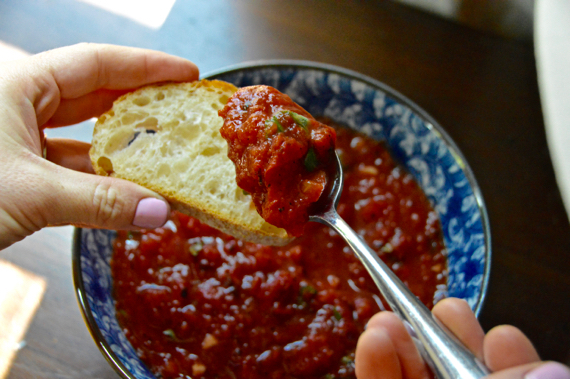 Of course, making your own red sauce isn’t a terrible idea either! The longer it sits, the better is tastes. Healthy, fresh, simple and delicious! 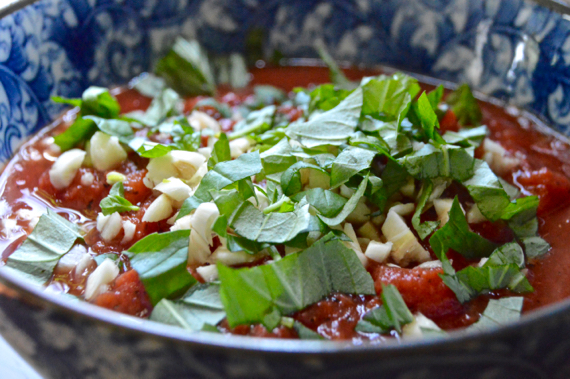 In a saucepan, warm the tomato sauce with the garlic and basil. Bring to a simmer and let it cook for about 5-8 minutes, stirring occasionally. Remove from the heat and add salt and pepper to taste. Add in red pepper flakes if you want a spicier flavor. Let the mixture cool, then serve by spooning a small amount onto a piece of baguette.